Today I finished work a little early and started looking for photos of me at the 2002 Olympics (post to be coming on 10 year anniversary. Still can’t find photos!). As I was looking through my old stuff (yes, I am a pack-rat and yes, I love it! ), I found a bunch of old newspapers my sister and I made, current events logs, and journals I kept. The thing that is amazing is how little I’ve really changed. The basic Rachel at 31 is in many ways the same at 8, 13, 15, etc. A couple things that I noticed from looking at these journals. First, how much I craved being special, being recognized, being first. 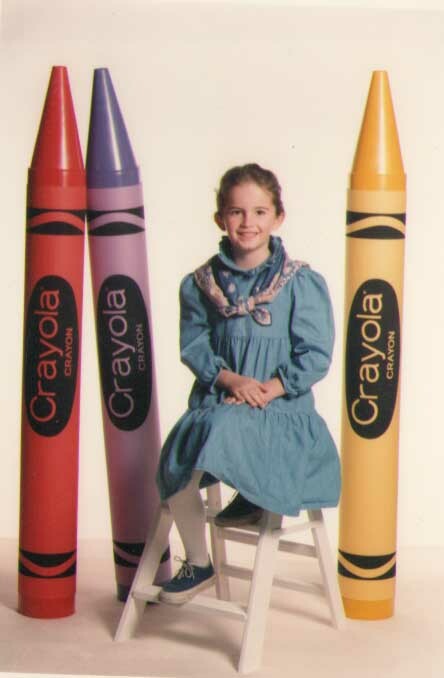 For example, I HAD to have this photo taken by the crayons because it was special. It wasn’t my Dad, the professional photographer, taking photos. 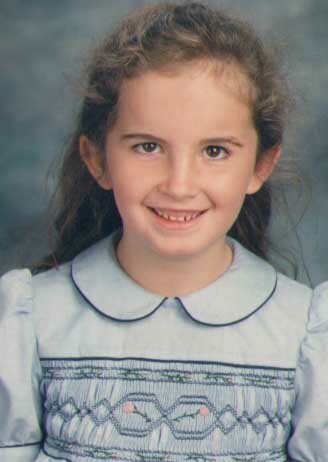 It wasn’t even the regular school shots. It was different and fun. The smile on my face shows a lot. Even my reactions to the people in my life seemed to carry more meaning than they might to other children. When Anna was just a baby we went to Disneyland and I write “I had an outrageous time in Disneyland. I remember how Anna was always laughing when I tickled her! I also went on a lot of rides and had a lot of fun” (12-31-1991). Isn’t it interesting that the laugh of a sister produced the same degree of glee as rides at Disneyland? Second, express basically the same interests then as I have now. Entries like “today we went swimming for a whole hour” are common with big exclamation points. I speak about cooking and when my friend loses her brother in an accident I say ‘our family brought them food on Sunday and I made an apple pie (All by myself no help from Mom!!) with homemade flaky crust and I cut the apples…’. See how independent and strong I was but with such a desire to serve those in need? I would still feel great about making an apple pie by myself (although I highly doubt I did so at the time!). Third, I was always confident in my testimony of my church and in Jesus Christ. October 21, 1990, “I love the Lord and Jesus Christ and I love it even more when you go to a place and have a great feeling and that place is the place where sins vanish. In the stake center or a church building when you are baptized and confirmed”. At a very young age I knew that the church was true and I could always feel it, never doubted. Once I made a decision I was done. Luckily for my parents, I made a lot of good choices! At an older age (probably 13) I said “The thing about knowledge is once we have a testimony. We must use it! Missionary work is very important. I know not everyone can be a full time missionary. But we need to use our knowledge to set a good example. If a friend swears you must (underlined) tell them to stop. Because it is better that you be embarrassed or picked on or made fun of than to make Heavenly Father sad” (quite a statement for a girl who was routinely picked on…). “I’m sorry but I didn’t buy the President’s speech! All the emphasis on working together and cutting taxes. He sounded just like Rush Limbaugh. If the president really plans to be better than great, but the Republican congress should not be in tears and all touched by Clinton’s speech though…The Republicans and the American’s just say to Clinton if you want to follow, follow, but you’re not leading” (Fall, 1994). What 13 year old says things like that? I love it! Its funny I can totally see the strabimus problem in this photo. I notice it all the time now. Things are just slightly off symmetry. I just think it is amazing that a child even knew about such things and then had the gumption to venture an opinion. I even have entries where I talk about balancing the budget and cutting taxes. In one of our newspapers I give an update on the 1991 primary presidential election and that ‘Bill Clinton is doing very well’. In high school I wrote “When I was a little girl I thought that everyone was special and everyone liked everyone else no matter what they looked like”. I think that was true, even about myself. I thought that I was special and I still do… I had a great desire to make others happy. I talk about sharing my testimony with others a lot because it was something that made me happy. Can’t you just see the little blogger inside some of those words? I’ve hopefully polished it a bit and gotten a bit more open-minded but the core is there. That desire to make others happy, to feel happy myself and to speak my mind is still with me.